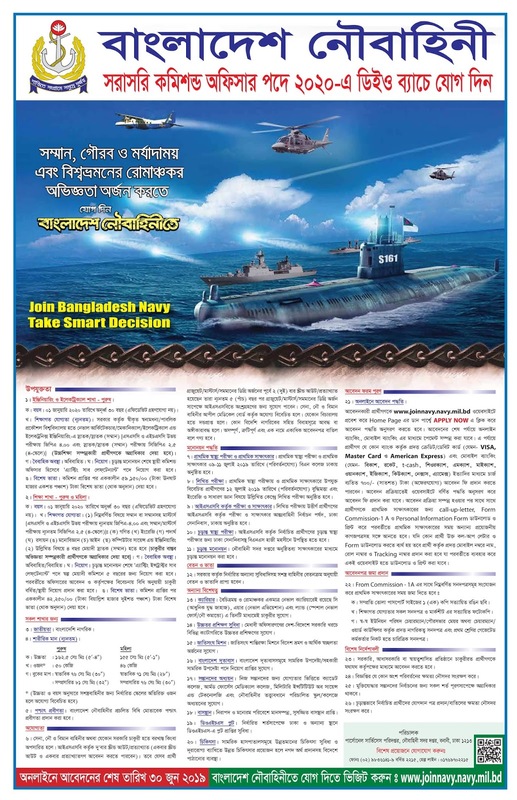 Recently, the notification for recruitment of manpower for the appointment of DAO batch ‘acting instructor sub lieutenant and acting sub lieutantant’ has been published directly in the Bangladesh Navy in the commissioned officer 2020. Interested applicants can apply till June 30, 2015. Educational Qualification: B.Sc Engineering on Naval Architecture / Mechanical / Electrical and Electronics Engineering. Minimum GPA 4.00 in SSC and HSC examination and CGPA 2.5 (4 scale) in BSC engineering. Recruitment: After the final nomination, the post of permanent commission officer will be appointed as ‘acting sub lieutenant’. Special allowance: After receiving the commission, a special allowance of Rs. 59,150 will be given. Age: 30 years of age on 01 January 2020. Educational Qualification: Bachelor of Science (Honor) in Psychology / Mathematics / English / Computer Science and Engineering / Chemistry / Materials / Law. Minimum GPA 4.00 in SSC and HSC examination and Honors (Honors) CGPA 2.5 (4 Scale). Recruitment: After the final nomination, short-term commission will be appointed for 5 years for the post of ‘acting instructor sub lieutenant’. Later on the application of the officer and according to the rules, employment bills / permanent appointments will be provided in accordance with the rules. Special allowance: After receiving the commission, a special allowance of 42,250 rupees will be given. Interested candidates will have to enter www.joinnavy.navy.mil.bd website and fill out the online admission form and submit it. At the end of the application, application fee of Rs.700 / – will be paid through online banking or mobile banking. After completion of the application process, call-up-after-first for the initial interview for candidates, download and print form Commission-1A and personal information form, and then a recent passport size photograph, all certificates of educational qualification, citizenship and Character Certificates The copies will bring together. Initially candidates will be selected by candidates from primary and secondary examinations from the applicants, written tests on their intelligence and English skills and general knowledge. Primary health examination and initial interview BNC College will be held in Dhaka at the center mentioned on 09-11 July, 019. Salary and allowances will be given in the Armed Forces, as per the pay scale, along with the other facilities, which are finally finalized. Apart from this, meritorious officers are entitled to higher education in different categories of government and government expenditure abroad, opportunities for foreign tour and UN peacekeeping missions, cadet colleges, Armed Forces Medical College, Military Institute of Science (MIST) and Navy The colleges will be given the opportunity to study.